Tomorrow sees the debut adventure of a new Doctor Who played by Peter Capaldi, heavily promoted by Space as an unmissable TV event owing to its street cred with geek chic culture, a worldwide cult following who will no doubt to cast a long shadow over next weekend's Fan Expo at the Metro Toronto convention centre. Not bad for a 51 year-old TV series. However not all that long ago, Doctor Who was in the inter-dimensional dumps. After being created in 1963 by Toronto born CBC brain trust Sydney Newman, the series ran for 26 years on the BBC before losing its mojo and becoming a creaky pantomime joke. It was cancelled in 1989, and faded into the limbo of cult television hell kept alive only by nerdcore books and comics, mostly written by fans. During those "wilderness years", rumours appeared frequently about Doctor Who's imminent return. Everything from Steven Spielberg producing an Americanized version with a rapping Tardis to a big screen version starring David Hasselhoff were mooted and booted. Few knew the truth was about to (de)materialize in Toronto. 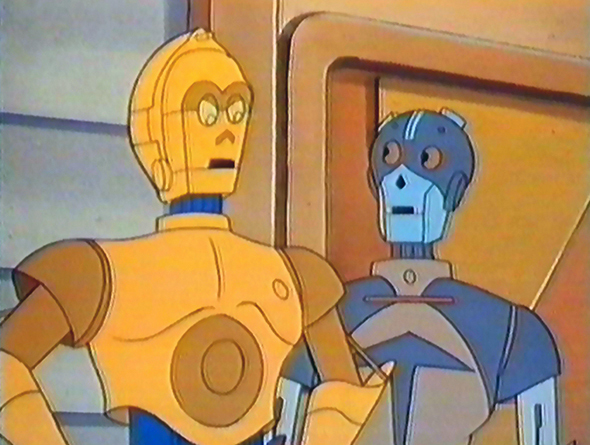 After Return of the Jedi , Lucas had wanted to continue to tell stories from the Star Wars universe and did so with a pair of successful Saturday morning cartoons produced by Nelvana- Droids and Ewoks. Nelvana began to pursue Sci-Fi/Horror properties and were in active development of animated series based on Jane Fonda's campy film Barbarella, Clive Barker's comic EctoKid and the Image comic Savage Dragon. 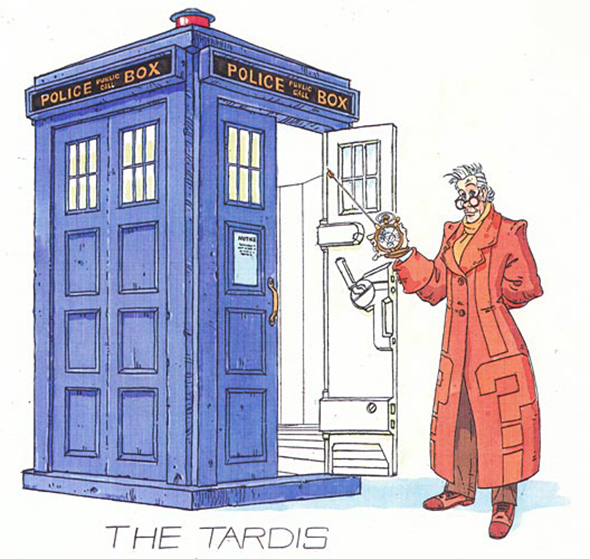 Sometime in early 1990, the BBC approached Nelvana with a proposition to co-produce a new series of Doctor Who, in animated form. Ted Bastien, now a supervising director at Nelvana, remembers it well: "We went through a lot of development on it, then we were scripting and storyboarding it and about 4 scripts had been written. It happened really fast". The BBC wanted to continue the show as it was (i.e not pitch it down to a younger audience) only as an animation to keep the costs down, and hopefully be able to sell more toys. Rather than base their sketches on a previous Doctor, the artists used actors such as Peter O'Toole, Jeff Goldblum and Christoper Loyd as inspiration, while plucking elements from other Doctor's wardrobes such as the scarf and hat. Respect was paid in full to the Doctor Who mythos by including newer versions of his enemies like the Daleks, Cybermen and friends like K-9. "We were instructed to make them as toyetic as possible" recalls Bastien, explaining the Dalek tank which would have allowed heads to pop on and off. K-9 was designed to fold into a Doctor's bag with a head that looks like a prophetic vision of an iPad. 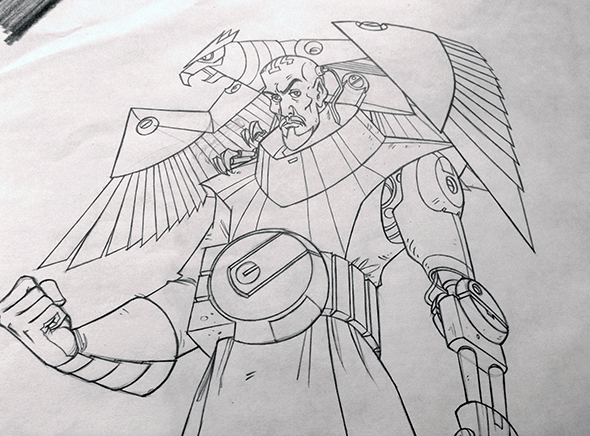 In keeping with the 90s obsession with cyborgs, the Doctor's arch enemy The Master was to be re-imagined as half man, half robot with a cybernetic bird accessory and a face modelled after Sean Connery. There would be Time Lords, screaming female companions from Earth, and lots and lots of epic scale battles which the live-action BBC show could never afford with their rubber band budgets. Those at Nelvana at the time thought it would be their biggest show to date. Sadly, this rebirth of the legend was not meant to be: "It was pulled out from under us" according to Bastien. After spending a considerable amount of time on developing, scripting and storyboarding the show, a BBC executive showed up with a representative from a UK animation studio who claimed they could do it for much less. The cord was pulled just as quickly and the world was denied a cartoon Doctor Who made in Liberty Village, where the Nelvana studios was previously located. Of course, the series did finally return full bore in 2005, to great acclaim and a new generation of fans. As with any cult TV show, seemingly every minutiae of Doctor Who has been thoroughly pored over, researched and documented, however its brief Toronto dalliance with Nelvana remains somewhat of a mystery. Bastien has no idea what happened to the scripts, or to the original drawings. Thankfully he hung onto some Xerox's and sketches, allowing us to get an idea of what it may have looked like. "Most people don't know this ever happened" says Bastien, with a raised eyebrow and mysterious look worthy of the Doctor himself.